Installing underground gas piping for a Firepit is a very popular gas line installation. An outdoor Firepit can be an amazing centerpiece to build an outdoor entertainment area around. 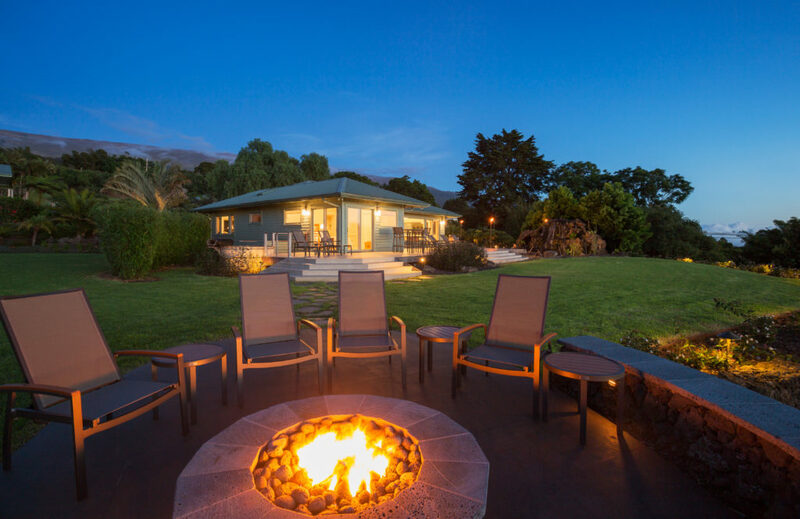 Nothing quite compares to the natural ambience of real flame, and your friends & family can’t help but end up huddled around a warm & inviting Firepit. Real flame brings back fond childhood memories for adults and creates new memories for the kiddos. However, there are a few basic things you should know before hiring a Gas Line Installation Contractor to install underground gas piping for a Firepit. There are only two legal types of pipe that can be used in an underground application. CSST, or corrugated stainless steel tubing, can be used underground if it is encased in conduit. However, due to the higher cost of the stainless steel product & brass fittings and the additional labor & materials to install the conduit, it is not typically feasible to use CSST for most underground gas piping applications. The most common and cost-effective product used for underground gas piping applications is polyethylene tubing. The correct polyethylene tubing will be yellow in color and clearly identified for natural or propane gas usage. Although the poly piping is flexible, it does have its limits and it’s very important not to kink the pipe in the ditch or put unnecessary stress on the underground fittings. The ditch should always be as straight as possible. If bends and corners are unavoidable, be sure to dig them in as large of a radius as possible to ensure there is no undue pressure on the polyethylene tubing. For comparison purposes, we will often tell customers to lay a garden hose down in a 12 foot diameter circle. The 12 foot diameter circle represents the maximum radius of a corner for an underground gas piping application utilizing poly tubing. The polyethylene underground gas piping must remain at minimum 18 inches below grade throughout the duration of the ditch. At both ends of the ditch, a hardened anodized steel riser will be used to transfer from the polyethylene tubing 2 standard npt pipe threads above ground. These risers are a large portion of the overall material cost associated with underground gas piping. The polyethylene tubing is relatively inexpensive per foot, however depending on the diameter of the tubing, the anodized gas risers can be somewhat spendy. The gas risers are essentially a 7 to 8 foot length of pipe bent into the shape of an l. They cannot be shortened or modified in any way. Therefore it is recommended to dig the last seven to eight feet of both ends of the ditch down further past the 18in minimum to a depth of 22 to 24 in which will keep the gas riser from unnecessarily protruding above the ground level. We also recommend that the last several feet of both ends of the ditch be dug perfectly straight so there is no undue pressure on the gas fitting located on the end of the Riser Underground. The polyethylene tubing is truly the best choice. Not only will it never corrode or rust, it’s flexible nature will allow it to flex in the event of ground movement such as from an earthquake may cause and will keep your underground piping trouble free and safe for the lifetime of your home. 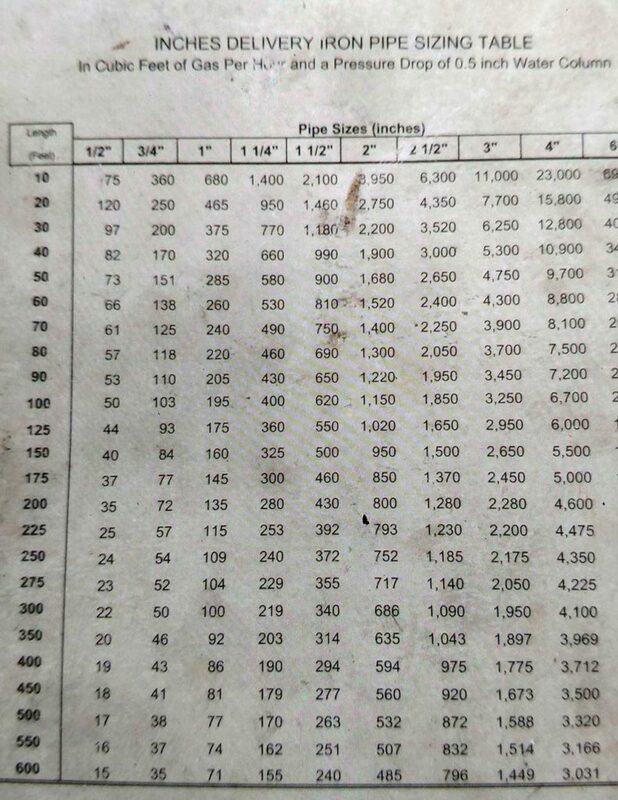 We get a lot of questions about the required diameter of pipe and gas sizing requirements for underground gas piping for a Firepit. It is not uncommon for a Firepit to have a maximum BTU load exceeding 300,000 BTU. This is a massive BTU load! In comparison, your average 40-50 gallon water heater only requires 40,000 BTU. We often get asked if a new underground gas piping line to a Firepit can be routed from an existing BBQ stub out. The answer 99.9% of the time is unfortunately NO. Due to the high BTU demands of most Firepits, we almost always need to begin the new underground gas piping line directly from the gas meter to ensure the Firepits high BTU requirements will be met. 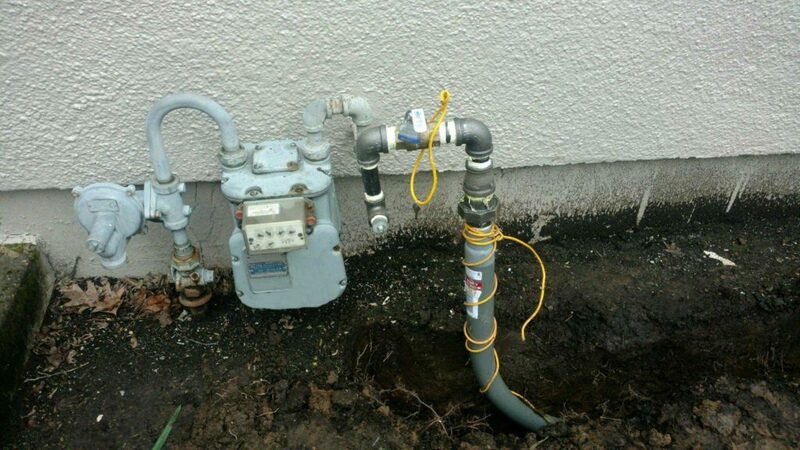 If your gas meter is in a location that prohibits underground gas piping, we can use a combination of exposed black Iron mounted to the side of your home to get past any obstacles such as sidewalks or driveways that might make direct burial underground gas piping from the gas meter not possible. Inportant Note: Black Iron Pipe can never be buried underground! It doesn’t matter if you paint it, wrap it in tape, or any other means of sealing the pipe, black Iron will fail if buried underground. Some of the modern Firepit kits can be much lower BTU loads compared to a Firepit built from masonry and gas rings. Of all the gas appliances we install underground gas piping for, Firepits vary the most on BTU load between models/designs. When designing and performing gas sizing calculations on multiple gas appliances, it can become somewhat tricky. Explaining all the details and methods of gas sizing would be an entire Blog Post in itself. However, for single underground gas line applications where the new gas line is starting directly from the gas meter, this simple chart provided by NW Natural can be used as a good resource. Hot Tip: When it comes to Firepits, always err on the high side when sizing the underground gas line! If you’re planning on using one of the modern self-contained Firepit “kits”, you will need to verify whether the manufacturer is supplying the Gas Controls/Valve and flexible gas connector for the final gas connection once the underground gas piping installation has passed the initial pressure test inspections. If the gas valve and/or controls are NOT supplied with the Firepit kit, then be sure to look thru the installation manual so you can be certain the gas valve is installed in the correct configuration and will remain accessible even after the Firepit is installed. If you’re building a traditional Firepit with stone or masonry, you will probably need a “Keyvalve”. We typically install the Keyvalve directly on top of the gas riser, and notch the back of the masonry to fit around the gas riser & keyvalve assembly. This method of installation keeps the keyvalve and gas riser completely out of the Firepit, reducing the risk of damage during routine cleanings. If your gas riser ends up off a little bit or you don’t have the tools to notch the masonry, you can always pipe from the gas riser to the keyvalve. Just be sure to tightly wrap any black iron installed in 10mil PVC Pipe Wrap to protect from corrosion caused by the lime in the masonry. Note: In Washington & Oregon States, underground gas piping may share a ditch with other utilities such as water lines or electrical. 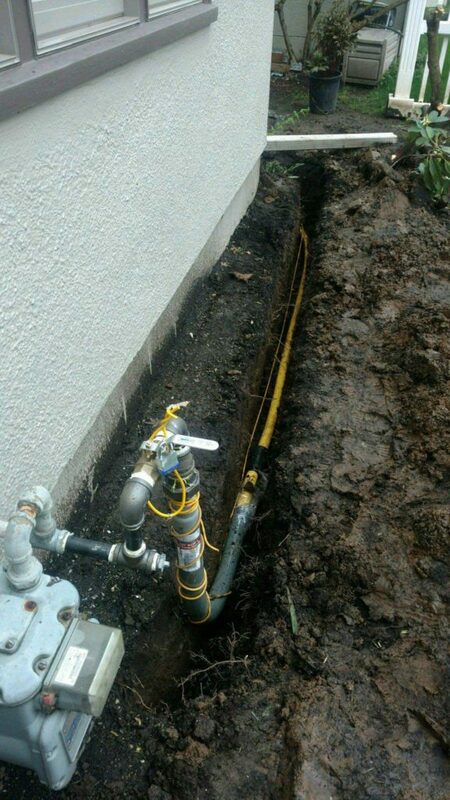 However, the gas line must be separated by at least 12 inches from all other utilities! When making your final connection to the Gas Meter, we always recommend an extra Isolation Valve right between the gas meter and the newly installed underground gas piping. With the added Isolation Valve, you will never need to turn the gas system Off to the home should your Firepit require service. Make sure you have the correct tools for the job! The polyethylene underground tubing must be chamfered at all joints. This is not something you can do with your handy pocket knife, you must use the appropriate sized Chamfer Tool to ensure a firmly sealed joint that will stay leak-free. Money Saving Tip: If you have made the decision to hire a Gas Piping Contractor to install your underground gas piping for a Firepit, ask them to itemize the costs of digging the ditch. With the bond & insurance requirements and overhead costs of a professional licensed Gas Piping Contractor, there is a good chance they are charging a much higher amount than you can find yourself for providing the ditch. Whether they are providing their own Journeyman Pipe Fitters at their hourly rates or even more likely are subcontracting the ditch work to a landscaping company and taking their markup off the top, providing your own ditch is a relatively simple way to save yourself some money! If you can’t find a neighborhood kid or family member to help you dig the ditch, consider hiring a landscaping company yourself to avoid the markup costs. Be sure to call for a line locate before any ditch work is started! I hope you’ve enjoyed this writeup on underground gas piping for a Firepit. If you have any questions regarding gas piping installations, please don’t hesitate to shoot me an email! A few more articles we think you might enjoy! thanks for all the valuable information Jeremiah. you definitely know your stuff. I am genuinely delighted to glance at this website posts which carries plenty of useful data, thanks for providing these kinds of statistics. I truly love your website.. Very nice colors & theme. Did you build this web site yourself? Please reply back as I’m looking to create my own personal site and would like to find out where you got this from or exactly what the theme is called. Appreciate it! N’oublies pas d’oГ№ tu viens. Deidre Pour avoir la moelle, il faut briser l’os. Quel che puoi far oggi, non differirlo a domani. Mega good! Interesting tips over here. It is pretty worth enough for me. In my view, if all website owners and bloggers made good content as you did, the internet will be much more useful than ever before. I could not resist commenting. I’ve spent 3 hours looking for such article. I’ll also share it with some friends interested in it. I’ve just bookmarked this website. Done with the work done, I will enjoy some live hot gay cams. Thank you very much!! Greetings from San Francisco!